Manchester United have reportedly identified a couple of replacements for goalkeeper David de Gea, should the Spaniard pursue a fresh challenge away from the club in the summer. Manchester United could face the prospect of losing both David de Gea and Paul Pogba in the summer, should they fail to qualify for the Champions League next term. Manchester United have reportedly made the decision to stick with David de Gea for the 2019/20 season irrespective of whether he pens a contract extension with the club. Paris St Germain are reportedly ready to make a 120 million euro transfer move for Spain international goalkeeper David De Gea this summer. 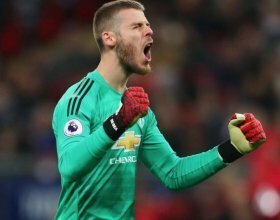 The Man Utd shot-stopper, who has been a revelation at Old Trafford since his arrival from Atletico Madrid, is considered one of the world's best keepers. Spain international David de Gea is reportedly prolonging discussions regarding a new contract at Manchester United with the club yet to meet his wage demands. Manchester United face a fresh fight to keep hold of David de Gea with Real Madrid considering a renewed approach to sign him during the summer. Manchester United are reportedly reluctant to meet the contract demands of David de Gea despite his contract due to expire in 15 months' time. David de Gea has reportedly told his close friends that he is on the verge of signing a new long-term contract with Manchester United. Spain international David de Gea is ready to commit his long-term future to Manchester United by signing a fresh contract with a bumper wage rise. Manchester United are reportedly struggling to commit goalkeeper David de Gea to a new long-term deal despite agreeing to match the goalkeeper's demands for a £350,000-a-week contract. Spain international Juan Mata is reportedly close to committing his future to Manchester United by signing a new contract. Spain international Ander Herrera is reportedly prepared to commit his long-term future to Manchester United following fruitful talks with the club's hierarchy. Manchester United are reportedly continuing contract discussions with goalkeeper David de Gea with his existing deal due to expire in the summer of 2020.